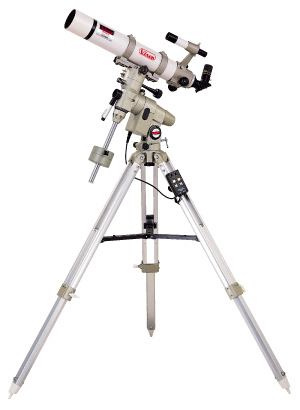 "the best lightweight German equatorial mount worth keeping..."
What is the GPE and when do we recommend it? Click on the image to see enlarged view (79,415 bytes). Overview: What is the GPE and when do we recommend it? The GPE is one of the most economical of the three "Great Polaris" series German equatorial mounts manufactured by Vixen Co., Ltd. The other model GP mounts include the similar but more accessorized GP model, and another which is similar in appearance to the GP but is its beefed up cousin the GPDX. The GP series are the descendants of the Vixen "Super Polaris" mounts which came to dominate the 1980's. In the USA the Super Polaris were distributed under the Celestron trademark, while the heavier duty "Super Polaris DX" was imported for a couple of years by Astro-Physics. The Great Polaris are an improved, modular German equatorial mount system where the customer is allowed to tailor the system to their particular needs choosing from a broad selection of accessories. There has been some effort to reduce the initial cost of the current GPE's by making some items optional which used to be included: Field Tripod, R.A. and Decl. Setting Circles (which were rarely used anyway) and the 6x 20 mm Pole Alignment Finder telescope. Refinements include a Dovetail Plate hardware mechanism to facilitate the quick interchange of payloads, a better selection of tripods and electronic drive systems. The now discontinued Super Polaris mount has been "cloned" by factories in third world nations. Some of these clones including the Orion SkyView offered by Company Seven have become quite accepted for very basic visual uses, and these can provide a good value particularly when one considers their cost is about half that of a complete GPE. However, the GP series mounts have not yet been equaled in performance or refinement by these knock offs. The GP mounts provide a superior selection of better engineered options. The GPE provides better rigidity pound per pound and weigh less than the clones due to the use of advanced materials, better components and design. And the GP mounts incorporate more precise tracking gear and bearing sets with smoother manual geared controls than those provided with the mounts made by imitators; this is particularly apparent to those who observe in below freezing environments. The choices of electronic drive systems are better for the GP than those available for other mounts at or below the cost of the GP mounts. And over time the GP mounts will require less maintenance and perform even better as the cheaper, grease packed mounts accumulate debris or the lubricants which help to make them perform well when new age and congeal. * there are factors acting upon a German mount affecting its suitability including: payload weight and length (torque), payload area and profile exposed to winds, desired tracking accuracy, tripod or pier resonance's, etc. What are most important to the user is how rigidly the mount holds the payload, how smoothly it tracks (amplitude and smoothness of the periodic error of a gear), and how well it overcomes the moment imparted by the load. 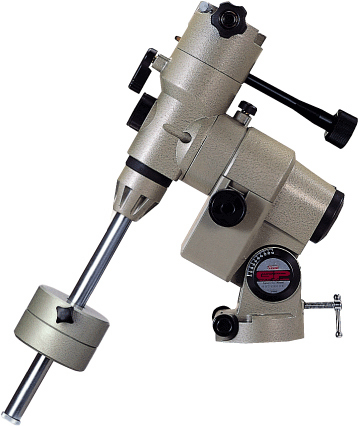 The final operating weight put onto a mount can also depend on how the instrument is to be accessorized. Vixen GP-DX Mount. Very similar to the GP mount but with even better rigidity to support the telescope in sites exposed to light winds. Vixen SPHINX SXW standard mount or the SX Compact (for compact lightweight payloads) "Go To" computer controlled mounts German equatorial mounts. Losmandy Hollywood General Machining Model GM-8 mount. A good choice of high precision tracking platform. Losmandy Hollywood General Machining Model G-11 mount. Excellent choice for astrophotography with reserve for growth to larger telescopes. Astro-Physics Model 400GTO mount. Excellent choice for astrophotography with "Go-To" computer control automation. The GP and GPE mounts are provided only with the Mount Head with Quick Release Saddle, 8.14 lb / 3.7 kg Counterweight, and Counterweight Shaft. To arrange a complete system one orders the other components "ala carte" buying only what is needed from a selection of good choices. Below Right: A complete Vixen 80Fl 3.15 inch Apochromatic refractor telescope shown on an accessorized GP German Equatorial Mount with AL130 Aluminum Field Tripod (38,522 bytes). Dovetail Plate hardware to attach a telescope or other payload onto the mount. Company Seven offers a number of third party accessories for the GP/GPDX mounts. These include Digital Setting Circle with Encoder sets, or optional fitted Carrying Bag (sample shown at right) which can provide for safer, and more convenient transport the mount with tripod attached. Keep in mind that these are very convenient and padded lightweight bags however, these are not suitable for shipping a telescope or mount. Company Seven do offer rather costly buy sometimes necessary Airline Transport Association approved shipping cases for these products which are suitable for check in on aircraft, or shipping by common carriers. Please visit Company Seven's showroom to see examples of these Vixen systems firsthand. Or you may Contact Company Seven for help putting together a system for you. Right Ascension Axis Worm Gear typical accuracy 20 arc sec. The SD-1 Drive Controller for the GPE/GPDX mounts operates from 9 volt DC power sources, it is provided with a cluster battery holder for six alkaline "C" cell batteries, and power cord. For convenience it is probably best to keep feeding the SD-1 the provided battery pack as it needs them. For operations in below freezing conditions then we recommend you keep the battery pack for the SD-1 in a warm area, possibly in a coat pocket when working near the telescope. Otherwise you may use more costly lithium batteries which perform better at lower temperatures. for economy use a sealed Deep Cycle/Marine/R.V. battery (easily found at automotive service and parts centers). This does not have to be the most immense battery; one designed for a golf cart for example will be more than be adequate for most needs. operate from wall current (GFCI outlet) with an AC/DC inverter: if you intend to use your own 12 VDC power supply then please ensure that it is noise free, and regulated to +/- 5%. It must have a current supply of at least 1 amps with no appreciable voltage drop. do not operate the instrument from a running vehicle as a supply source. A malfunctioning alternator or voltage regulator as well as cycling vehicle power demands can produce power surges and appreciable amounts of AC power which can easily damage the micro controller in your instrument.